Plans are made, so much to do to create my hangings - and then - I injure my back, hurt whilst camping in Milan and not dealt with. Agony. I have not been able to do any work this week. I am doing what I can. One morning, unable to sleep, I finally gave in at about 5.30 am. and I set off with my camera. The sun was rising. 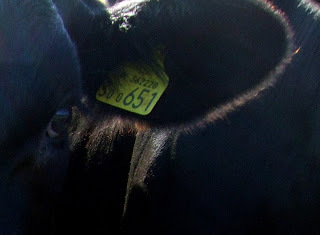 It was beautiful.I was enjoying my morning with a herd of heifers, remembering my cows, Melody, a contrary Jersey cow, a person whom we loved dearly. Salefka, another temperamental Jersey was used to being milked from both sides and she kicked. I bought a calf, barely a week old, a Hereford Friesian, Edwina, whom I fed with an enormous bottle. I hung over a 5-bar gate, awed at the beauty of the glistening morning, my expert moooos drawing a small herd of young heifers. I was caught up with the sun shining on their drool, their feathery whiskers, laughing at their curiosity and personalities. An ear - backlit by the morning sun. 'Is it edible?' 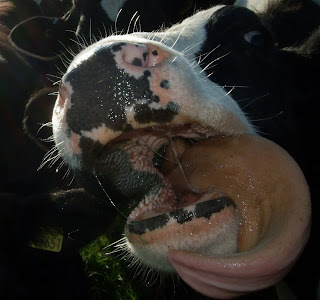 Cows explore with their tongues. 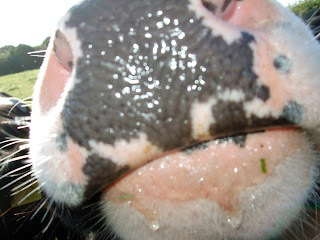 The detail of the inside 0f a cows mouth is incredible in this one. 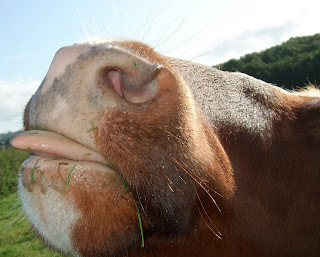 A nostril. Quite a Zen shape which is what I love. 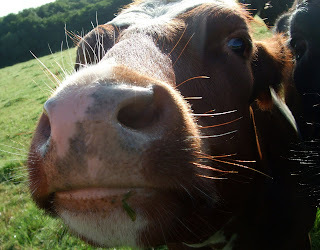 A cow is exploring my face and I manage to capture this wonderful image of her nostril, a swirling echo of other imagery of pipes in fabric and spontaneous drawing in meditation. This, to me is the wonder and beauty of design. Drool, like dew in the early morning. We have created many vegetarians in our time with the animals. It is true. Many children think meat is something bought in a supermarket, 'food on a nappy', as Mel says - could be made from anything. Children are horrified that they eat these beautiful animals, as sentient as cats and dogs. I love livestock but one cannot avoid the killing. I had to give it up. My point is that all events in our lives make us the people we are. The animals are part of my design process, my design thinking, my own sentience, part of my Soul.